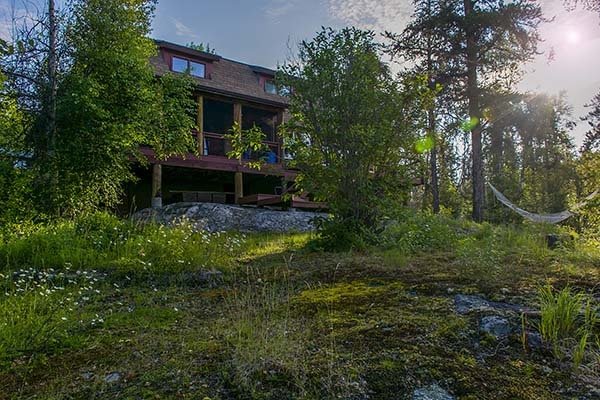 Forest House is Canada's premiere Boreal forest wilderness lodge. Located on a small, pristine, unnamed lake in Saskatchewan, Canada's northern forest, Forest House has been carefully constructed to have minimal impact on the delicate Boreal forest Eco-system. The main lodge, two cabins, and spectacular organic garden took thirty years to come to fruition. Original builders, Deb Peters and Rick Kolstad lovingly crafted their vision using lumber harvested from the local forest, banks of solar collectors to generate power, and a self-composting septic system. Every single detail of Forest House's construction, from location, to materials, to the self-sustaining garden was meticulously planned to create a harmony between technology and the natural beauty of the Boreal forest. Saskatchewan's northern Boreal forest is a wondrous place. It offers unparalleled beauty, thousands of cool, clear lakes, and bountiful plant and wildlife. The tapestry of the forest is in a state of perpetual evolution, providing unique vistas with each season. Forest House sits in the middle of the McLennan Lake area of Saskatchewan, which has been described as an "Eden" in the forest. It is the perfect place to experience nature at its finest, to walk in forests that are virtually untouched, to re-connect with yourself and the world around you. At Forest House, time is yours. Relax on the deck with a good book; explore surrounding lakes; hike the Boreal forest; observe wildlife; enjoy a sauna by the lake. 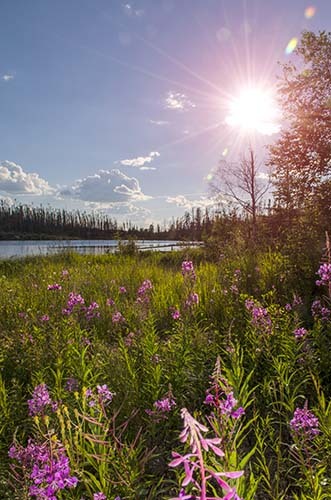 Experience the breathtaking beauty of the northern Boreal forest in luxurious, Eco-friendly accommodations offering serenity, solitude, and peace-of-mind. Deb Peters and Rick Kolstad began building Forest House 30 years ago. The place as it stands today is a testament to their vision and their skill as stewards of the land and master. The dream began more than 35 years ago. Rick was travelling around western Canada looking for a place he could build his private sanctuary. On the advice of a friend he headed into northern Saskatchewan. That lead him to the MacLennan Lake area. After spending a summer canoeing and exploring the area, he chose a spot on the south shore of a small nameless lake. Rick attempted to get a lease on the property. The government representative said no leases were available at that time. And he added with a wink, "Don’t you dare go out there and build a cabin without a lease". Rick gathered up his log working tools and headed out to his chosen nameless lake. Soon a small well camouflaged cabin was built. To make it difficult to see Rick did not peal the logs and covered the roof with moss. It wasn’t until several years later that Rick was able to get a lease on the property. That first fall Rick met Deb in La Ronge and convinced her to join him in his dream. They moved out to Rick’s newly built log cabin a few days later with a winter’s supply of food. Rick tells a story from their first winter: He had been ice fishing on a nearby lake. After catching enough trout for several meals, he began the snowshoe journey home. It was well after dark by the time he crossed the portage into their lake. He could see the light of the coal oil lamp in the window of their cabin across the lake. He knew that the love of his life was working in that light baking bread for him. And he had just caught fish. Rick said that he could imagine no better feeling. And so Rick and Deb lived like this for the next several years in their little cabin on the shore of their nameless lake. It didn’t take the two of them long to realize that the spot Rick had chosen for their cabin wasn’t the best spot on the lake. They looked longingly at a rock bowl on the north side of the lake. The snow was gone from this spot more than a month sooner than their hidden place on the north side. Deb was dreaming of gardens and flowers. Rick was dreaming of basking in the warm spring sunshine. It only took a visit to the government people in La Ronge to get their lease transferred to this preferable spot. A new, bigger, better cabin was built partly from lumber from dismantling the original cabin. Deb immediately began the process of making soil. There is almost no natural soil in this region of the north. They had already began composting at their old site and Deb hauled canoe loads of soil across the lake. She spent days getting soil from crack in the rocks, sifting out the small stones and mixing this with compost. It was a time consuming task. But the result was that soon Deb was able to grow some of their own vegetables. The gardens grew as they were able to produce more soil. Now, 30 years later, their gardens are the envy of everyone. Rick and Deb realized their cabin was too small. They began the construction of the Lodge. While the Lodge was being constructed a dream started forming in Rick and Deb’s collective minds. Couldn’t this be a place where people could come to relax and reconnect to the natural environment? Couldn’t this be a place where people could come to learn about the boreal forest? Couldn’t this be a place where we could demonstrate sustainable living? The more they discussed this dream the more Rick and Deb believed they should work at making this dream a reality. The process of turning their place into a business took quite some time. They had to get the proper licensing. They had to increase their capacity. There were many things that had to be done to make it legal and ready for guests. But in the late 90s they opened their doors to guests. Those who came discovered a place beyond their imagination. The beauty and serenity of the spot was a surprise. Ric fell in love with the northern Precambrian Shield country in the early seventies. Since then he has made his living guiding and organizing adventures for guests who come from all over the world. 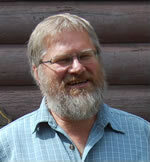 Ric started guiding canoe trips in 1973. In 1987 he purchased Churchill River Canoe Outfitters and has managed this organization ever since. He has worked hard to see the preservation of an intact eco system in this section of the Boreal Forest and Precambrian Shield. In many ways, his partnership in Forest House Wilderness Lodge is a logical next step. He sees Forest House as a perfect vehicle to teach guests of the beauty, fragility and value in preserving this part of Canada’s north. As a child, Tom was fortunate to live for a few years in the first nation village of Ft. Chipewyan at the western edge of Lake Athabasca on the sliver of PreCambrian Shield country that cuts through Alberta. Memories of canoeing through clear water lakes ringed by granite cliffs and boreal forest have motivated him to return to the “Shield” country of Saskatchewan as often as possible. Extended trips such as the Clearwater River and the full length of the North Saskatchewan River from the Rockies to The Pas Manitoba have allowed him to share his passion for canoeing and the wilderness with his wife, Lisa, and their children. Professionally, Tom has dedicated most of his working life to environmental protection advocacy, including 16 years as a senior staff with the Pembina Institute [provide link]. He currently works as an entrepreneur developing businesses owned by him and Lisa. Tom sees Forest House as a wonderful opportunity to marry a passion for the outdoors with a concern for environmental preservation disciplined by business practices.